Dysphagia is a condition in which disruption of the swallowing process interferes with a patient's ability to eat and drink. But it should be seen in a more wide prospective including the huge impact that this problem has on the social/family interaction and on the personal/emotional status of the child. Therefore the treatment approach should not focus only to biomechanically make feeding safely possible but also should consider the emotional aspect of eating (pleasure, social moment etc.). Ask questions to the parents like: does the child cough when eating and drinking? How often? With certain texture more than others? Do you have any weight/growth concern? Did you notice something that make you think your child has feeding problems? Did the child get chest infection? If yes when? How often? Is the bowel movement regular? He has been ever investigated for feeding problems? Does he vomit after lunch? How much does he drink? What food does he like more? And what he doesn’t? Did you ever find food in her mouth? Is breath difficult, noisy when eating/drinking? etc. Children with CP have normally poor alignment due to altered postural and motor control, this, in most of the cases, leads to poor oral motor control and therefore eating/drinking problems. As well poor breath capacity makes more difficult to take food in. These 2 aspects need to be addressed before starting any assessment of eating/drinking difficulties. Keep in mind that signs of food aspiration are more difficult to detect than liquids/saliva aspiration. It is due to lack of stability of the lower jaw not providing base of support for the selective movements of the tongue in all directions. It is very important to look at feeding considering the strong connection with sensation and hands as well. Hand’s sensory cortex is very close in the homunculus to the mouth sensory cortex, therefore when stimulating one the other is also activated. 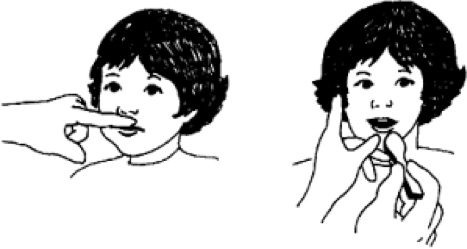 Stimulation of hand sensation, manipulation, grasp release, hands to face before/during feeding can help mouth movements. It is a facilitation technique to time and grade mouth opening that helps as well maintaining good alignment and a base of stability for more selective jaw movements. Create a quiet environment and slowly introduce an element of distraction when the child’s ability progresses - start with backround sounds like radio. A small, shallow-bowled spoon will be most appropriate to help the child remove the food from the spoon though lip closure. Some adapted equipment may help children in achieving independence during meal time, for example angled spoon, scoop plates etc. For children who have difficulties grasping and manipulating the spoon, specific hand-over-hand assistance can be provided and then gradually withdrawn as motor control improves. Assisted eating for part of the meal or snack may help to develop functional skills, without compromising nutrition. It is very important to introduce tooth cleaning as soon as possible, using fingers before the toothbrush, using water at first and tooth paste later on (see notes for more details regarding the techniques). GOR is defined as the frequent return of stomach contents into the oesophagus caused by a dysfunction of the lower oesophagus (normally the lower oesphagael sphincter prevents free reflux of gastric content into the oesphagus. Pressure on the Abdomen (Eat too Much, Pregnant Women). Posseting and Vomiting - Significant quantity sometimes hours after the feeding) but sometimes they don’t vomit at all! Pressure Changes within the Abdomen / Thorax - Increase tone - spasms - constipation - scar tissue after surgery etc. Children with Gastrostomy normally have increased reflux symptoms therefore before applying the gastrostomy investigation should be done. Parent-reported indicators for detecting feeding and swallowing difficulties and undernutrition in preschool-aged children with cerebral palsy. ↑ 1.0 1.1 1.2 1.3 1.4 Finnie NR. Handling the Young Child with Cerebral Palsy at Home. Elsevier Health Sciences; 1997.